NEW ORLEANS – With under two weeks to go until the NCAA Division II Cross Country Championships it is time for the final edition of the NCAA Division II Men’s Cross Country National Coaches’ Poll which was released by the U.S. Track & Field and Cross Country Coaches Association (USTFCCCA) on Wednesday. The results from Regional Championship Weekend shook up the poll especially in spots No. 7-25 in which every program in that 19-team range experienced some kind of movement. Adams State was selected as the No. 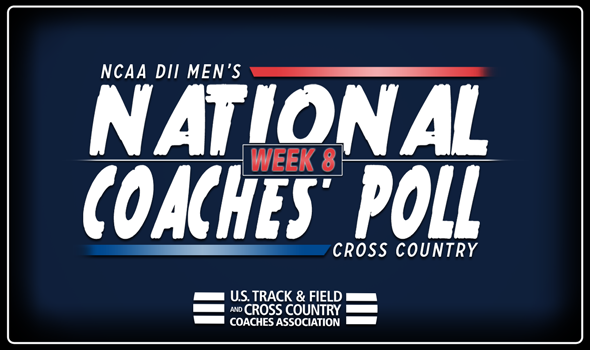 1 team in the nation for the ninth consecutive week after receiving five first-place votes. The Grizzlies, the defending national champions, will enter NCAAs as the favorites once again. The last program to hold in the top spot in the country for an entire season was Damon Martin’s team back in 2012, in which they concluded the season with a win at NCAAs. It is the first time this year that the program was not the unanimous top team in the poll. Adams State was knocked off at the South Central Regional Championships by the next team on the list, No. 2 Colorado Mines, by a 49-57 margin. Not to fear for the program, though, as their regional performance has not affected its end result of winning the national championship in recent years as it has won two in a row and five in the past six years. The Orediggers remained No. 2 despite a victory over the top-ranked Grizzlies this past weekend. Colorado Mines was paced by individual champion Grant Colligan and placed all five of their scored athletes in the top-17. The program received three first place votes for their strong effort. To wit, Colorado Mines is the only program other than Adams State to win a title since 2012. The Orediggers won the NCAA title to end the 2015 season. It was the first and only national championship in program history. Holding at No. 3 was Grand Valley State after a win at the Midwest Regional Championships. The Lakers won their 17th straight regional crown and had top finishers in second-place Zach Panning and third-place Enael Woldemichael. Grand Valley State recorded 38 points at the meet. The program will be looking for its first national championship for its men’s program. Coming in at No. 4 was Chico State who experienced no change from the previous poll after winning the program’s third consecutive West Regional Championships. The unit was led by individual title winner Eddie King who became the fifth athlete in program history to win the individual championship. Chico State had all seven athletes finish in the top-18 to score 39 points. The Wildcats will be after their first national championship. Rounding out the top-five was No. 5 Western Colorado who punched its ticket to NCAAs with a third-place finish at the South Central Regionals. The Mountaineers finished with 84 points behind top-ranked Adams State and Colorado Mines. It’s top finisher was Taylor Stack who came in seventh overall as an individual. Western Colorado is looking for its ninth national title. It is the third poll in a row where that has been no movement to the top-five programs. Also staying put was No. 6 Queens (N.C.) after a victory at the Southeast Regional Championships, the first for the program since 2011. The Royals placed three runners in the top five which included third-place finisher Daniel Wallis. Queens is after its first national crown after earning the automatic bid to nationals. No. 7 Missouri Southern had a six-spot improvement after winning the team title at the Central Regionals. They were led by individual champion Gidieon Kimutai and posted the lowest team score in program history at the regional meet with 55 points. It was the first title won for the Lions since the 2009 season. They too will race at NCAAs. No. 8 Simon Fraser shot up three spots after a runner up finish behind top-ranked Chico State at the West Regionals. Pierre-Louis Detourbe paced the group with a sixth-place finish as the Clan placed all five scored athletes in the top-21 to earn an automatic berth to nationals. Also improving was No. 9 Saginaw Valley State who climbed one spot from the previous poll. The Cardinals earned a NCAA berth after a second-place finish at the Midwest Regionals. The group was led by Tom Goforth who finished fourth overall. All five scored athletes came in the top-30 at the meet. Jumping up two spots was No. 10 CSU-Pueblo after a fourth-place finish at the stacked South Central Regionals. The performance earned the Thunderwolves an at-large bid to NCAAs for the third time in program history. The team had two top-five finishers and placed three in the top-20. CSU-Pueblo has only been in the DII ranks since 2014. Missouri Southern, Simon Fraser, Saginaw Valley State and CSU-Pueblo are chasing after its respective program’s first NCAA Championship. The largest gain in the poll went to No. 16 Cal Poly Pomona after a seven-spot improvement. No. 14 Walsh also shot up five spots, No. 11 Augustana (S.D.) jumped three and No. 21 Embry-Riddle (Fla.) climbed two. It was the best mark received by Walsh in program history and tied for the best in Embry-Riddle school history. Five new teams joined the poll this week in No. 19 Southern Indiana, No. 20 Black Hills State, No. 22 Western Oregon, No. 23 Stonehill and No. 25 Augusta. It was the first time entering the top-25 this season for Black Hills State and Augusta. It is only the second time in program history that Augusta has been ranked as it tied a program high for best mark. Cedarville, West Texas A&M, American International, Cal State San Marcos and Hillsdale also received votes.